Any time a Pokemon has allowed you to draw cards, it’s always been played around with in some form or another. I’d imagine that today’s card is no exception. Uxie is a Basic Psychic Pokemon, 70 HP, with a Psychic Weakness, no Resistance, and a Retreat Cost of 1. Set Up lets you draw until you have 7 cards in hand, as long as you play Uxie down from yours. It is a Poke-Power, though, so anything that can hit those will stop this effect. Psychic Restore then is a 1-for-20 that lets you put Uxie and any cards attached to it at the bottom of your deck. Is there any wonder to why this card was so good? It was so good, it even saw play in what was the Modified format, and it was so good in that format, it saw a ton of movement – even now, the average market price sits at around $10 a copy! Not bad for a card that’s only 10 years old these days. But naturally, it’s all in what it does – just like Shaymin-EX in Roaring Skies, Uxie helps to set-up further plays by ideally drawing you a bunch of cards, and he’s got an effect to shuffle himself away. Not that big of a deal when you can just grab him once again. If it ever saw print again, there’s no doubt Uxie would be automatically included in every deck. Drawing cards is just extremely valuable, and having that outside of a Supporter or an attack is highly sought after. Arora Notealus: There have been a few Uxie cards that worked in tandem with Mesprit and Azelf, but none of those really saw any play on the scale that this Uxie did. Really I’d think that the obvious answer to blending them together is to have tremendous effects when the presence of one of these others is present. For instance, maybe Uxie would be played from hand to draw up to 4 cards, but with Mesprit and Azelf in play, you draw 2 more cards for each one for a total of 8. Similarly, you could have effects with Mesprit and Azelf as well that coordinate with each other and Uxie – I imagine Mesprit does a round of healing, possibly on each turn, while Azelf lets you do more damage based on if Uxie and Mesprit are also in play. It’s even flavorful in tapping into what the Lake Trio are all about! Next Time: And then we turn up the heat once more! Our Throwback Thursdays for this week is Uxie (DP Legends Awakened 43/146), which is what I suggested. It was one of the first few cards I was given from my classmates around 2010, which is when I started playing the Pokémon TCG. I still kept this as a sentimental value to this day, but I didn’t realize how good this card is until I read about Shaymin-EX (XY Roaring Skies 77/108). As such, I might be making comparisons between the two as they share some similarities. Both Uxie and Shaymin-EX carries the Set Up Ability, though in Uxie’s case, it draws cards until you have seven cards in your hand, while Shaymin-EX does the same but up to six cards in your hand. It also has an attack that makes those Pokémon leave play. Psychic Restore costs C for 20 damage, and puts this Pokémon and all cards attached to it to the bottom of your deck. Although this doesn’t put it onto your hand, you can easily get this Pokémon and some those of other cards from the bottom of your deck – ideally – with Underground Expedition, which was legal during Uxie’s time, and also got reprinted in SM Celestial Storm. Shaymin-EX, on the other hand, has Sky Return, that does 30 for CC, and puts this Pokémon and all cards attached to it onto your hand. Both of those Pokémon risks getting disrupted. If the deck is shuffled, Uxie and other cards are not exactly in the bottom of your deck due to randomness; likewise, if your hand is shuffled, then you have to search for Shaymin-EX. And then there’s attributes that would matter. Uxie has 70 HP, which is frail, but worth a single prize and searchable with Level Ball; Shaymin-EX has 110 HP, which is slightly durable but worth two prizes, as well as benefits, obstacles, and exclusions pertaining to EX Pokémon. Uxie is a Psychic Type, which can do double damage to Pokémon weak to Psychic types, which is found on some Fighting and Psychic types. The base damage of 20 might not be worth exploiting weakness, but that’s before factoring damage boosting items to make it matter. In modern times, that would be Uxie with Choice Band to do 50 to EX/GX Pokemon. Against Buzzwole-GX, that would be 100 damage right there, a 2HKO territory. Because of this attack’s effect, you not only conserve this Pokémon, but also an energy and Choice Band goes back to the bottom of the deck as well, ready to be used again if you can get it out. Shaymin’s Sky Return does 30 damage, but can’t exploit weakness because no Pokémon in the Expanded Format is weak to Colorless. Although not allowed, it might be important in Legacy because some Pokémon from HGSS series are weak to Colorless. Uxie is weak to Psychic, and although a +20 Weakness instead of x2 weakness makes it considerably bulkier, it’s 70 HP won’t matter in the long run. Shaymin’s Lightning weakness is actually a bad weakness now due to Lightning type support on the next set. Two uses of Electripower is enough to take out Shaymin from any attack from Lightning Pokemon that does damage in the first place. Fighting resistance may be useful, but that only means needing one more piece of support to break even. Now that the comparisons are over with, it’s time to access how well this card does. Well, it actually does incredibly well in its own time. And if you read previous reviews on both Uxie and Shaymin, you be able to see why. And I’ll link those for you to see. Drawing cards via Ability is valuable because it makes other Supporter cards that don’t draw cards use a bit more freely, though you can still play a draw Supporter to dig through your deck deeper. Uxie saw universal play due to Set Up, and that it’s only attack cost a energy of any kind, making it splashable. The review gave near perfect scores for the Uxie review and the first two reviews of Shaymin-EX. However, I overrated on the third review. I did not realize how risky it is to run high counts on those Pokémon. When you use a Pokémon just for their one and done deal, it just sits there waiting to be KOed for easy prizes. The same may be said on Uxie on modern times, if it were to be reprinted. It would replace Shaymin-EX, and being worth a single prize makes it more bearable should you have to place two Uxie in play. Even then, it faces even more competition against other Pokémon that draws cards in a different way, like Zebstrika from Lost Thunder and Dedenne-GX from a 2019 expansion that can fake being a nerfed Sycamore due to their abilities, but you can still use your Supporter on your turn. 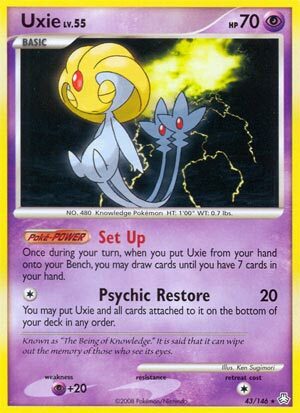 Somewhat related but not essential, Uxie Lv.X can be put on top of any Uxie card, and it is a Leveled Up Psychic Type with 90 HP, Psychic weakness of X2, and a retreat cost of one. It is still regarded as being a Basic Pokémon. It’s Poke-power Trade Off lets you look at the top two cards of your deck, put one of them into your hand and one of them in the bottom of your deck. This is a “better” Acro Bike since you get to conserve the cards instead of discarding them. But sometimes, you would want to discard something just to get it back later and to thin your deck a little, which Acro Bike excels. Still a good ability to constantly use, if Uxie Lv.X doesn’t get dragged to the Active and getting KOed. This card could’ve seen use if it were legal along with today’s card. Zen Blade does 60 damage for CC, which was pretty good at the time even though you can’t use it next turn (that clause can be reset if it switches). Put a Choice Band in modern times, and it becomes 90 damage for CC. It was the 8th best card of 2008 (https://www.pojo.com/COTD/2009/Jan/7.shtml). Uxie is NOT a good card to use in a +39 deck, so you need more than one basic in Limited. That is because if you use Psychic Restore, Uxie leaves play, and with no Benched Pokemon to replace it, you lose the game. Other than that, it is useful to get more cards, but in Limited, hand size tends to get bigger due to mostly drawing dead cards from a card pool based on just one expansion that you can’t make too much use of. Notes: I’m trying to not give perfect scores unless it was earned. Uxie is pretty close to being perfect if not for some shortcomings based on the card itself and the action of players. Still a great card to use, though I would not want a single prize Pokemon that does the same thing (but better) come back to modern times. If it were to eventually come back, then it should be branded with the GX status and make Psychic Weakness X2 instead of +20. Anyways, Uxie has better features and has a better rarity than Shaymin-EX; it is just a regular rare, but is somewhat expensive, being about $10 a piece! Today we look at Uxie (DP – Legends Awakened 43/146) the “good” Uxie, officially released August 22, 2007, which means it ought to have been legal for the very end of the 2006-2007 (DX-On) Standard Format and the entirety of the 2007-2008 (HP-On), 2008-2009 (DP-On), and 2009-2010 (DP-On AGAIN) Standard Formats. This Uxie has only been reviewed once before, BUT it was as our second place pick for the Top 10 Cards of 2008. A related card, Uxie LV.X (DP – Legends Awakened 146/146), was reviewed as both a regular CotD and as the eighth place pick of 2008. If you go back to read these older reviews, remember that you’ll not only encounter older mechanics – like Level-Up cards – but outdated terminology as what we call the Unlimited Format was originally called “Standard” (because it WAS the default Format when the game began) while what we now call the Standard Format was originally known as “Modified” (because it was a modification of the then “Standard” Format and not the automatic default for tournament play). With all that out of the way, Uxie is a [P] Type Basic Pokémon with 70 HP, [P]+20 Weakness, no Resistance, Retreat Cost [C], the Poké-Power “Set Up”, and the attack “Psychic Restore”. Being a Basic has almost always been the best in the Pokémon TCG, though Uxie released near the end of the roughly six-year span when that was not the case. By the end of Uxie’s run, however, being Basic was obviously a blessing because it meant being faster to the field while also needing the fewest cards to play a single copy. 70 HP wasn’t as tiny back then as it is now, but it was still small and carried a real risk of being OHKO’d, even without its Weakness being applied. Uxie released during the time when x2 Weakness was NOT the norm and instead takes 20 extra damage. At this time, cards might take from +10 to +40 damage and those they really wanted to be vulnerable still had the classic x2 Weakness. Needless to say, only taking an extra 20 damage is better than everything but no Weakness or taking only +10 damage. I’d love to see Weakness only be good for a flat +20 damage. The lack of Resistance was typical back then, just like now, and a Retreat Cost of [C] was about as good back then as it is now. Set Up should sound familiar to those who still play Expanded, because this is almost the exact same effect as the “Set Up” Ability found on Shaymin-EX (XY – Roaring Skies 77/108, 106/108). Both versions of Set Up activate when you play that Pokémon from your hand to your Bench. Uxie’s version is a Poké-Power instead of being an Ability; Poké-Powers are a subset of the original non-attack-effect, the Pokémon Power. Any effects which state they apply to Pokémon Powers OR Poké-Powers will apply to Uxie’s version of Set Up… but NOT effects that work on modern Abilities, Poké-Bodies, or miscellaneous other non-attack-effects. Poké-Bodies were also a subset of Pokémon Powers, and when using older cards, know that an effect which states it applies to both Poké-Bodies and Poké-Powers works on Pokémon Powers as well. This was actually a good system, as it allowed for strong but not overwhelming counters to such effects. The other major difference with Uxie’s Set Up is that it allows you to draw until you have seven cards in hand, while Shaymin-EX only allows you to draw until you have six in hand. There is also text stating Uxie’s Set Up can only be used once-per-turn, but it is just a reminder that you don’t get to this exact same instance of Set Up multiple times in one turn, or again the next turn. Assuming all other conditions are met and nothing is negating Poké-Powers or preventing you from drawing, you can play as many copies of Uxie as you are able in a turn, and each allows you to draw until you have seven cards in hand. You can even use an effect like that of Super Scoop Up to bounce the exact same Uxie to your hand, then play it to draw again, just as players can and do with Shaymin-EX. Uxie has the attack “Psychic Restore”, which allows you to attack for 20 damage then bottom-deck Uxie and all cards attached to it. This was decent enough for the time, as 20 damage went a little bit further back then. Though Uxie doesn’t Evolve, Uxie LV.X was a card you could play onto your regular Uxie card, so long as that Uxie was your Active. A LV.X card is similar to a BREAK Evolution, as it is played on top of its regular counterpart, uses that card’s “bottom stats” and retains access to that card’s Poké-Bodies, Poké-Powers, and attacks. The differences are that “Leveling Up” doesn’t count as Evolving, LV.X cards aren’t played (and printed) sideways, and the “LV.X” part of the name technically is not part of the name. Huh? You’ll notice the LV.X uses a slightly different font if you’re looking at an actual scan of the cards; for the Rule of 4, Uxie LV.X is treated the same as Uxie, so you can only have a total of four in your deck. Uxie LV.X has the Poké-Power “Trade Off”, which let you look at the top two cards of your deck, then select one to add to your hand while the other was sent to the bottom of your deck. Its text states that Trade Off cannot be used while Uxie (meaning “this Pokémon”) is affected by a Special Condition, which was typical of most Poké-Powers. What is unusual is that Trade Off’s text about it being a once-per-turn use is worded so that it really is only once per turn; you can’t use another instance of it during that turn. For [CC] Uxie LV.X can attack with “Zen Blade”, doing 60 damage but Zen Blade states it can’t be used again during your next turn. Both Trade Off and Zen Blade were very good back in the day; by modern standards, Zen Blade is merely okay but Trade Off is still pretty good. You might be wondering how Uxie didn’t even get a review until the Top 10 of 2008 countdown; Uxie LV.X received a regular review and no, it wasn’t really a twofer that covered today’s Uxie (though they are from the same set). It helps to know what the number one card of 2008 was: Claydol (DP – Great Encounters 15/106), which officially released in February of that same year. Remember how some folks preferred Octillery (XY – BREAKthrough 33/162) to Shaymin-EX? Well, imagine if Octillery had released first and its Ability let you bottom deck up to two cards before you went to draw. Yeah, Claydol’s “Cosmic Power” Poké-Power lets you take up to two cards from your hand and put them on the bottom of your deck, then draw until you have six cards in hand. It stops working if Claydol is affected by a Special Condition, and is a once-per-turn-per-instance (before you attack) kind of effect. Besides the Special Conditions thing, which won’t matter if Claydol is on the Bench, the only advantage Octillery enjoys that Claydol doesn’t is that Shaymin-EX is worth two Prizes when KO’d, but Uxie is only worth one. Claydol was even Standard Legal at a time when Rare Candy could immediately Evolve a Basic into its Stage 1 form or directly into its Stage 2 form, and eventually was legal while Broken Time-Space allowed you to immediately Evolve anything. So Uxie is a better Shaymin-EX but wasn’t a four-per-deck-Staple because it was competing against a better version of Octillery, in addition to the general differences in what did and did not work for their respective metagames. If Uxie received a pseudo-reprint that only changed the things it absolutely had to – Weakness becoming x2 and Set Up becoming an Ability, it would instantly become a staple, with decks that were capable of utilizing most of what was drawn and not needing most of their Bench space maxing it out (or at least running three). This would enable explosive openings but it would be more likely to hit the field (either from spares or recycling) later in the game because it would only be an easy single Prize and not an easy two Prizes like Shaymin-EX. It would be even better in Expanded, where Level Ball could fetch it from your deck. Both the actual Uxie and a hypothetical (near) reprint are most welcome sights in Limited, but remember that playing down your hand, searching, etc. aren’t as easy here (though draw power is even better than normal). Unless you pull something worth running entirely solo (like a big Basic in a +30 build), you’ll run as many Uxie as you can pull. Realistically, if we got something similar to this card released, it would be tone down, probably drawing less and being a Pokémon-GX, or drawing a lot less if it was still only worth one Prize. This all is even less likely when you consider that Dedenne-GX has been confirmed for future release; we don’t know everything about the card, but what we do know is that it will have an Ability that discards your hand to draw six cards. We don’t even know if this is a “coming into play” Ability or a once-per-turn effect, though I’d bet on the former as we will soon have a Stage 1 Zebstrika with an Ability that is once-per-turn-per-copy (before you attack) and discards your entire hand to draw four cards. At least, if I were a betting man that is how I’d lean; it is possible that Zebstrika will be almost instantly outclassed by a Bench-sitting, low HP Basic Pokémon-GX. The main thing I want to you take away from this is that Shaymin-EX, a card that may have warranted banning (even though it never came close to happening), is really a nerfed Uxie! The second thing I really hope you got out of this review is that Uxie wasn’t even seen as super-potent during its day because the metagame was just that crazy, with as good (maybe even better) non-attack, non-Trainer draw options. This is one of those times I hope the powers-that-be do not repeat the past.